Ultrasonic scalers use high frequency vibrations to break down and remove plaque and tartar that accumulate on teeth. Plaque and tartar can cause gingivitis and periodontal disease in people of any age. Ultrasonic scalers use a vibrating thin metal tip and a stream of water to create microscopic bubbles that implode on the surface of the tooth. We use ultrasonic scalers for most routine adult cleaning. The vibrations eliminate tartar in hard-to-reach areas without disturbing the tooth enamel. This helps you to maintain optimal gingival and periodontal health and maximizes the benefit of routine dental cleaning. Ultrasonic scalers offer benefits that manual scaling does not. Manual scaling relies on pressure to remove built-up tartar on the tooth surface. The pressure needed to remove tartar can cause discomfort. 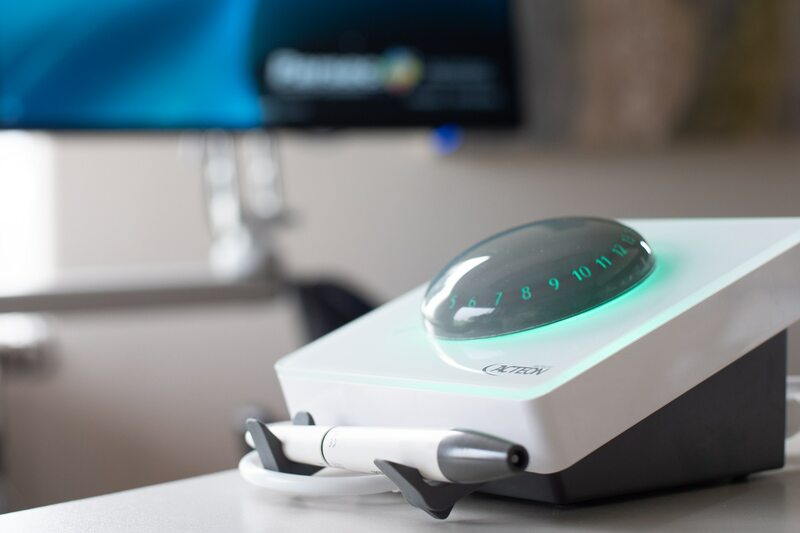 An ultrasonic scaler uses virtually no pressure. This approach is not only faster than manual scaling, but it also makes you more comfortable. Ultrasonic scalers don’t entirely replace manual scaling. Once we’ve finished cleaning your teeth with an ultrasonic scaler, we’ll review your teeth with a manual scaler to remove any deposits that may have been left behind.